Socialization prepares people for social life by teaching them a group’s shared norms, values, beliefs, and behaviors. Socialization prepares people to participate in a social group by teaching them its norms and expectations. Socialization has three primary goals: teaching impulse control and developing a conscience, preparing people to perform certain social roles, and cultivating shared sources of meaning and value. Socialization is culturally specific, but this does not mean certain cultures are better or worse than others. Jeffrey J. Arnett: In his 1995 paper, “Broad and Narrow Socialization: The Family in the Context of a Cultural Theory,” sociologist Jeffrey J. Arnett outlined his interpretation of the three primary goals of socialization. The role of socialization is to acquaint individuals with the norms of a given social group or society. It prepares individuals to participate in a group by illustrating the expectations of that group. Socialization is very important for children, who begin the process at home with family, and continue it at school. They are taught what will be expected of them as they mature and become full members of society. Socialization is also important for adults who join new social groups. Broadly defined, it is the process of transferring norms, values, beliefs, and behaviors to future group members. 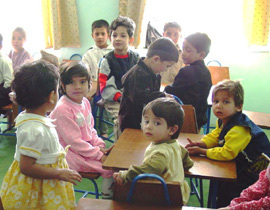 Socialization in School: Schools, such as this kindergarten in Afghanistan, serve as primary sites of socialization. In his 1995 paper, “Broad and Narrow Socialization: The Family in the Context of a Cultural Theory,” sociologist Jeffrey J. Arnett outlined his interpretation of the three primary goals of socialization. First, socialization teaches impulse control and helps individuals develop a conscience. This first goal is accomplished naturally: as people grow up within a particular society, they pick up on the expectations of those around them and internalize these expectations to moderate their impulses and develop a conscience. Second, socialization teaches individuals how to prepare for and perform certain social roles—occupational roles, gender roles, and the roles of institutions such as marriage and parenthood. Third, socialization cultivates shared sources of meaning and value. Through socialization, people learn to identify what is important and valued within a particular culture. The term “socialization” refers to a general process, but socialization always takes place in specific contexts. Socialization is culturally specific: people in different cultures are socialized differently, to hold different beliefs and values, and to behave in different ways. Sociologists try to understand socialization, but they do not rank different schemes of socialization as good or bad; they study practices of socialization to determine why people behave the way that they do.